Posted July 14, 2016, in News. 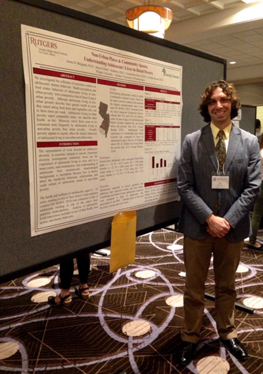 On Thursday, June 9th, Dr. James Morgante presented at the 46th Annual Meeting of the Jean Piaget Society for the Study of Knowledge and Development. This year, the thematic focus of the meeting was Places & Spaces in Children’s Lives. The presented poster, Non-Urban Places & Community Spaces: Understanding Adolescents’ Lives in Rural Poverty, addressed an area of psychological science that has not been sufficiently investigated by researchers and practitioners, as the representation of work focused on adolescent development in economic contexts has been uneven. Economic diversity investigations commonly focus on the experiences of adolescents living in cities and, to a lesser extent, rural communities. Understanding of adolescents from economically disadvantaged backgrounds is incomplete because less is known about the health-risk behaviors, relationships, and youth culture of those raised in non-urban poverty. The presented poster provided insight into the influence of economic context on adolescents’ dietary behaviors. The health and wellness of adolescents, aged 13 – 19 years, residing in two of New Jersey’s least populous counties, Cumberland and Salem, was compared to that of adolescents residing in one of the state’s most populous municipalities, the city of Camden. Cumberland and Salem County are the state’s poorest counties and maintain the highest unemployment rates in the state. Estimates from the latest American Community Survey indicate that 31% and 23% of children under 18 years of age in Cumberland and Salem Counties, respectively, are living below the poverty line. Adolescents’ experiences in Cumberland and Salem Counties were compared to those of adolescents living in the city of Camden, where 52% of children live below the poverty line. Adolescents responded to survey questions that addressed their perceived wellness. Analysis of adolescents’ lived experiences included review of their health, food access, and dietary behaviors. Overall, preliminary results suggest that poverty equally affects the dietary behaviors of adolescents living in non-urban and urban areas. It is Dr. Morgante’s hope that this research initiative will contribute to the general understanding of poverty’s impact on youth and adolescent development. Page last updated by Senator Walter Rand Institute for Public Affairs at 3:08 pm July 14, 2016 . This page was printed from http://rand.camden.rutgers.edu/2016/07/14/piaget-presentation-2016/ at 4:32 PM Monday, April 22, 2019.